Macbooks from Apple are vastly different from other PC laptops in terms of their design. The Macbook Air and Macbook Pro Retina models feature beautiful trackpads with a layer of glass on top. This implementation, besides being astatically pleasing, allows for smooth scrolling, tapping and a host of finger gestures. However, it is not without its flaws. There has been a host of Macbook Air and Macbook Pro Retina Trackpad issues. Dust and moisture sometimes penetrate the microscopic space between the top layer of glass and the electronic sensing mechanism underneath it. Over time, this causes the trackpad to become insensitive, which results in the loss of the clicking function. In some Macbook Air and Macbook Pro Retina that we have encountered, trackpads issues appear to cause random cursor clicks and movements. In some scenarios, the trackpad could not detect tapping or clicking. Sometimes typing via the keyboard is affected as well – sometimes the keyboard does not respond to typing and the typing lags. The loss of clicking function with trackpads is common in the Macbook Pro 13 inch unibody models. Recently, we have seen a slight increase in the number of Macbook Air and Macbook Pro Retina Trackpad issues particularly in the Macbook Air 13 inch 2013 and later models as well as the Macbook Pro 13 inch and 15 inch 2012 – 2015 models. The implementation of Force Touch trackpads in the newer Macbook and Macbook Pro Retina 13 inch and 15 inch that removes the mechanical clicking mechanism with an electronic taptic engine below the trackpad appears to have resolve trackpad issues. The taptic engine mimics the clicking function by providing haptic feedback to the user fingers whenever clicking is detected. To resolve the issues mentioned, trackpad replacements are required. At Mac Plus, we provide replacements with genuine original Apple parts, though our repair rates are 30 to 80 percent lower than Apple Authorised Service Providers. Do contact us at 87817928, hello@macplus.sg or www.macplus.sg. This is what can happen to your Mac if you spill water on it. This is an actual photo of a customer’s MacBook Air logicboard that we are trying to save. The customer who sent it in to us spilled water on his Macbook Air, but was not aware, and continued to use his Macbook Air for weeks. This is what could happen to your Mac or iPhone if you spill water on it and put in rice for days. Contrary to popular notion, rice does not do much in reviving your water damaged Macbook or iPhone. It might take away some moisture but the water can start to corrode your logicboard. If your Mac can start after a spill, you might be doing some kind of electroplating on your logicboard without realising it can fail to the extent of beyond repair. Most spills on Macs when sent to us in a timely fashion can be rectified. Don’t turn it on again or you risk short-circuiting it, making repairs harder. We have successfully repaired almost 100 percent of water damaged Macbook that were sent to us within 1-2 days. Those that were beyond repair were typically because the users continued using them for weeks or months, without realising their Macs were already growing mould. Do bring your Macbook Pro, Macbook Air for servicing with us as soon as possible after it has come into contact with water or beverages. The success rate depends a lot on the amount of time liquids have been left in the Mac. A number of customers have been experiencing Macbook Pro Retina sound distortion issues. Although the Macbook Pro Retina has distinctively louder and better sound speakers resulting in better sound quality, the slimness of the Macbook Pro Retina has resulted in speakers which have slim designs and speaker cones which wear down over time. Some Apple users have reported that their speakers distort at maximum volume. Our opinion is that any speaker, even the best ones distort at maximum volume, so it is always a good idea not to max out your Mac’s volume. We recommend that you get external speakers for your Mac though. We at Mac Plus use Audio Engine A2+ speakers. 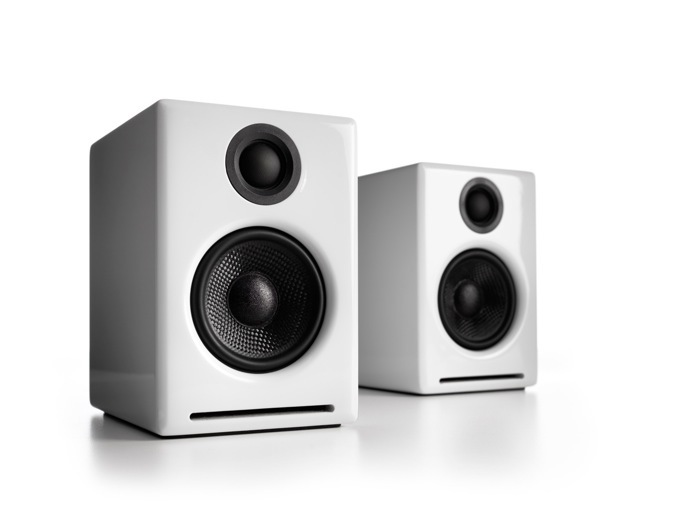 They are popular entry level speakers that are popular with Mac users. Macbook Pro Retina speakers typically only spoil after 2 years or more, so most users hoping to get them repaired within the warranty period are out of luck. Macbook Air and iMac speakers do not seem to be affected. Pictured above are the speaker replacements for Macbook Pro Retina 15″ Speakers for Mid 2012 – 2015. We have them in stock and they come in a pair. Our stock are sold to us in pairs so we replace both speakers instead of just the affected piece. The speakers go through wear and tear so it is advisable to change both the speakers anyways. We are able to do Macbook speakers replacements for Macbook Pro Retina 13″ Late 2013 – 2015 models, as well as Macbook Pro 13″ unibody A1278. Contact us for pricing details and stock availability if you are experiencing MacBook Pro Retina sound distortion issues. Installation takes around 10 mins.